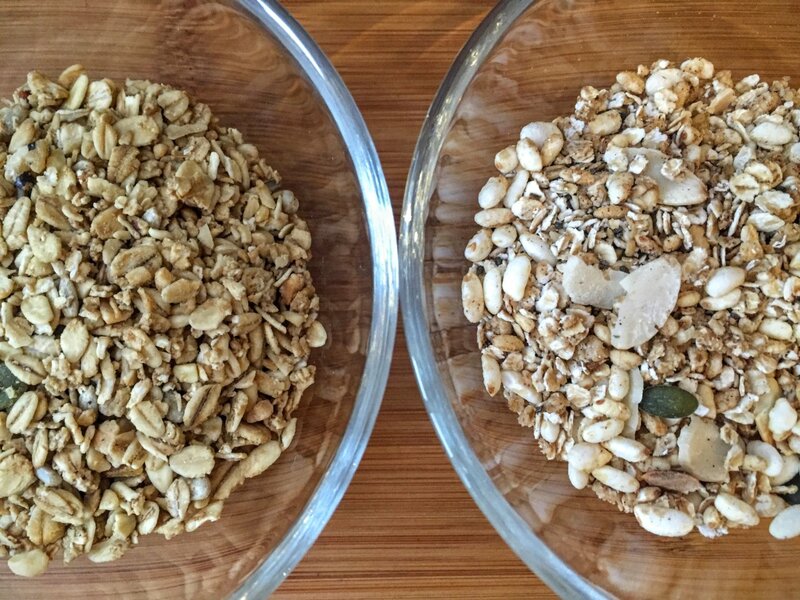 Since starting the 90 Day SSS Plan I’ve seen lots of posts on the subject of granola. 1. where do you get low sugar juice from, I’ve been everywhere! 2. is this amount of sweetener really necessary? 4. how do you mix this stuff together, I’m about to pour it all in the sink to mix! 5. there’s not enough liquid to bind it together. 6. mines powdery, where’s the clumps of granola? 7. my granola went mouldy in storage. Now I’ve made no secret that I’m not a fan of cereal, but this plan as you’re already finding out is a little heavy on the food prep, so a ready made goto rest day breakfast wouldn’t go a miss, so I made a batch and wrote another blog post called Making Joes Granola where I make the recipe exactly to the method but I’ve written notes against the original method to help you get the best result possible. To be honest, it’s been really handy having a batch in the cupboard. The sweetness of the granola is cut by the greek yogurt. At first I wasn’t so sure but I think I went a bit cheap on the yogurt. I recommend you buy name brand greek yogurt and the texture is lovely. Is it worth making? At first I wasn’t sure. During a shopping trip we stumbled across Lizi’s Granola, the low sugar variety people are having somewhat illegally and decided we’d have this once Joe’s was finished. This morning as I measured out mine and Mr Burble’s granola I decided to open Lizi’s and have a mixture of both granola’s for breakfast. The Lizi’s is on the left in the picture and Joe’s is on the right. Lizi’s looks good, it’s a lovely colour, still no clumps so to speak, but the taste………..what taste? I get a feint taste of walnut with an oaty after taste. And the texture? Well everything seems the same in my mouth. WIth Joe’s, yes it’s sweet but as you’re making it you can cut down on the amount of sweetener you add. Some of the fruit flavours from the juice still comes through as well as the cinnamon and the texture of the different ingredients is lovely compared with Lizi’s almost uniform mix. If you want clumps you can add more water to help bind the mixture but it’s quite the workout for you teeth as it is after it’s been dried out. So, who wins? For me is Joe’s hands down. I’m glad I tried Lizi’s but I’m going to be making another batch pretty soon and I think I will try adding more water to see what it does to the taste as well as the texture. So Joe’s fallen out with his Aunt Lizi and replaced her granola. Let hope he stays on good terms with his cousin Lucy who has Bees and of course his Uncle Ben. Don’t want to have to find alternatives now I’m so far in……….